After buying a 3D printer, you will also have to think of ongoing cost in the form of buying filament. The cost of one filament reel can be anything from $20 upwards. Depending on your printing needs, the filament can last a few weeks and even months. If you choose the best filament, you can sit back and relax as your jobs quietly finished in the background. You won’t have to be always checking the filament to ensure it works as expected. On the other hand, if you choose a poor filament, you may experience a nightmare when printing objects. The finished 3D models or parts may be of a poor quality. Choosing the right filament for your printer can be quite a challenging decision. This is because there are many brands to choose from, with each manufacturer claiming theirs is the best. In this article, we highlight the best PLA filament available on the market based on consumer opinions and their experiences with these products. Why Should You Choose PLA? You might be asking yourself why Polylactic Acid filaments, otherwise known as PLA, are the most popular filaments for 3D model production. Most home-based 3D printers are designed to use this filament to printing 3D objects. PLA is often used as an alternative to materials like ABS. When melted, it rarely gives off an odor. And when it gives off an odor, it smells similar to cotton candy. Can be melted at low temperatures i.e. 190-210°C. You will not necessarily need a heated printing bed when starting your print since the material does not shrink when it cools down. Is environmentally-friendly and biodegradable Moreover, it is made of corn starch, which is a positive compared to the other plastic-like petroleum materials that other filaments are made. For years, PLA has been used inside candy wrappings as medical stitches. Therefore, you can be certain about it safety. Not all PLA filament in the market are created equally. If you settle for a cheap PLA filament, you are likely to end up being disappointed with the quality of your printed objects. You will be wasting your money buying a cheap PLA filament. You are likely to find a filament strand that is something like 1.75mm in diameter. This diameter is the most popular with manufacturers. Ideally, you want the diameter of your filament to vary by less than 0.05mm along the length. In the worst case scenario, the diameter of the filament could be variable on one reel. For instance, the diameter could be 1.85mm at the jump of the spool and 1.63mm at the ending part. There’s not much you can do about this. At best, you could adjust the feed setting in such a way that it suits the thread before each build. The printer settings will have to be adjusted each time you buy a brand new reel or in case you change it. This is amongst the reasons you have to keep the slice of your PLA filament as near to a circle as you can. If you purchase a cheap filament, you will have a more oval section shape, which can lead to frequent jams. When it comes to tolerance on the diameter of filament, the best 3D printer brands will prevent any of the above-mentioned problems. If you buy a cheap PLA filament, you will often end up with a reel that contains some impurities. The impurities could be as a result of poor standards during the manufacturing process. For example, if a company adds a plaster to make the product economical to manufacture, the result could be a filament with impurities. This impurity in the PLA can block your printer’s nozzle because they don’t liquify in the same way PLA does. The finish you will get on your final model will also not be satisfying. In some cases, you would want all the pieces to be of the same color. For example, when you are building chess pieces, all of them should have the same consistent color. If printing with a poor filament, you can end up with parts that are differently toned when you switch reels. The poor filament will make your parts colors look slightly mismatched. Having consistent colors is even more significant in the business world when you create products you want to sell. You customers will want consistency in what you produce every time. You filament needs to be wound neatly onto the spool to prevent tangles and problems with feeding into the printer. If the filament is too tight closer to the ending of your spool, there may be some breakage. Keep your wound just right, i.e., not too tight. When you pack and store you PLA filament, it is important to keep dampness and any air out. The filament can be negatively affected by these environmental elements. You filament might also kink. Therefore, try by all means to prevent physical damage to avoid breakage. In other cases, your filament might bend and jam your printer. Invest in some good packaging to protect your filament. Manufacturers of good quality filament will use a plastic wrap that contains desiccant on the inside and a cardboard on the outside to prevent tears. In the packaging and on the website of good filament manufacturers, you will find information on how to tune your 3D printer to work optimally. The information may also include support for the various 3D printers on the market and technical specification like the melting temperature of the filament or the span tolerance. This is a very important factor to consider when purchasing filament. If you ship from China, it might take a few weeks for your reel to arrive. Therefore, if you have an urgent project, shipping PLA from China would not make sense. PLA filament also has to be warehoused correctly because it is affected by moisture. So, if your product takes a few weeks to get to you, chances are that it would have been exposed to the elements of nature around it. Read on for the best PLA filaments that will provide you value for your money. You will also learn about the filaments you should avoid. You are guaranteed hassle-free printing when you make use of the PLA filaments mentioned in this article. You will also get high quality printed models from the filaments. 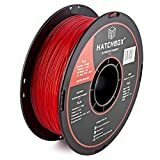 Hatchbox has become reputable for the reliable quality of its filaments. Hatchbox PLA filaments come in various colors, including metallic and neon. The colored filaments are among the best in the market. If you choose the red filament, that is exactly what you will get; not something that appears partially orange. Hatchbox will provide you with the Pantone number of the filament you choose. This way, you will know the exact hue of the strand. You’d expect more brands to do this but surprisingly, they don’t. Right out the box, you will notice that this filament has some superior touch to it. It’s very neatly wounded on the spool and feels smooth. The diameter tolerance is +/- 0.05mm, which is precise for most of the spools. According to consumer reports, the tolerance is way better than what is quoted, at +/- 0.025mm. Users report to have fewer jams in their 3D printer with the Hatchbox filament. This could be because the filament’s cross-section has near to flawless cylindrical tolerance. As mentioned before, the colors you will get when printing with this filament is excellent, even on the thinner sections of your object or the edges. Look no further for the best PLA filament in the market. Its price to quality ration is the best you can find out there. This is without a doubt a quality filament you’ll love. 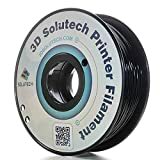 This filament is highly rated on Amazon and provides unbeatable value for money. There are no distinct settings you have to tune when you want to print with this filament. If you are a beginner or even an expert you will get the best printing results. However, you may have problems restocking as often times, it’s out of stock on Amazon. The +/- 0.02mm accuracy of the Worksteel filament makes it stand out from the crowd. This is perhaps also the safest filament you can buy with a 90-day money back guarantee from the manufacturer and a warranty for 2 years. Unfortunately, you can only choose between black or white filaments. You will have little ovality with this +/- 0.02mm filament. The 3D printing supply also provides very little oscillation on its spool. The filament is smooth like the Hatchbox and you will notice this in the final product. However, some customers have reported get some light threading here and there. The filament produces a small amount of odor. Therefore, you won’t smell much when you are printing. Even though the Worksteel is a budget-friendly filament, you will be surprised by the high quality prints it provides compared to some known brands out there. This company doesn’t have a big user base and therefore is not as popular as other filaments on this list. However, if you buy it, you will have peace of mind with their 90 days money back and 2-year warranty. If you want to print black and white with PLA without having to spend a lot, I highly recommend Worksteel filament. This eSun filament is more flexible than others. You may think the filament is stronger but in actual fact, it is just a lot less breakable. This is very useful when you want to print parts that are have load and would be better bent than snap. The filament is less likely to break when you’re feeding it into the tubes. The eSun PLA filaments are available in 22 colors. Their glow-in-the-dark filament is greyer and looks less appealing compared to what other brands are offering but the brightness is still noticeable. 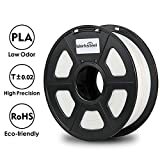 This company also has “cleaning” filament that you can use to clean the nozzles of your printer. You only need about 0.1Kg of the strand for this purpose. The quality of your parts printed is above average. However, when you compare these colors are slightly duller when compared to those of Hatchbox PLA. Customers love this filament because of the reliability and consistency you get at this value. Coming at about $5 less than the Hatchbox filament, the eSun PLA Pro offers a great value for money. eSun caters more for mid-budget consumers that want something that works well. The unique features of this filament are outstanding. I consider the eSun to be somewhere between PLA and an ABS filament brand. If lively colors are not a priority for you when printing, you should purchase the eSun PLA Pro. PLA filaments from MakerBot are of premium in quality. The filament can also be used by children because it doesn’t contain contaminants like metals or BPA. MakerBot PLA stand out from other brands due to the comprehensive quality test that is done at different layer resolutions to improve the quality of your prints every time. The filament comes in different lengths and an array of colors. Like you would expect from a US premium brand, MakerBot PLA colors are consistent, the diameter spot on and the product of excellent quality. MakerBot PLA filament produces solid and consistent colors. However, some colors might appear darker than what they are on the reel. The price of this premium brand matches its quality. If you are looking for good and reliable filament and can pay a bit more, purchase this filament. However, when you consider the value for money get, there are certainly other better choices on the market like eSun and Hatchbox. MakerBot is a trusted name in the 3D printing world. The filament manufactured by this brand is a premium brand and its price confirms that. However, don’t have too high expectations in terms of quality compared to other filaments that cost significantly less. The Solutech filament is a budget product. However, the company has built a good reputation for itself over the years. The product is produced in China but distributed all over the US by appointed dealers. 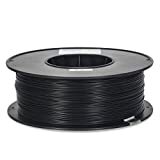 Therefore, you can purchase your filament at a cheap price and get it shipped fast to your door step. The filament has an excellent cross-sectional form with a diameter tolerance off +/- 0.02mm. The product is smooth and produces 3D objects with a glossy shiny finish. Some impurities are probably present in this filament as it is recommended that you use it at a higher temperature compared to other PLA filaments. Some users indicate that they have had to turn up the heat to 240°C to obtain the print they want successfully. The colors on the spool are also slightly different than what you might expect. For example, the white appears more like a creamy color than the pure white you get with Hatchbox. After you start printing, the color also becomes a bit different making it hard to tell exactly what color your object will end up being. There isn’t a big difference with this filament and other similar priced ones on the market. This would be the best PLA filament if you are not too keen to getting models of the exact colors you send to the printer. The PLA filament manufactured by AMZ3D is very similar to that of Hatchbox. You may even wonder whether this is not the same filament just packaged and shipped under different brand names. You get to choose from a wide variety of rich colors, including metallic. The AMZ3D PLA filament has a dimensional accuracy of +/- 0.03mm. Its spools are well wounded to prevent tangles and come under the right weight. Some customers have mentioned that this filament is a bit brittle. If this is something you want to avoid at all cost, especially if you have delicate or thin parts, I recommend you choose the eSun filament or those that are manufactured by Hatchbox. The AMZ3D is among the best filaments on the market. The filament seems identical to the Hatchbox but is a few bucks cheaper. Consistent users might run into problems as the price and the availability of this filament usually fluctuates. Even though this brand still has a lot to do to establish a good user base, its PLA filaments are definitely amongst the best on the market. If you prefer buying from a well-known brand, I recommend you go with the Hatchbox PLA filament, which has consistent stock and reliable prices. This is perhaps the cheapest brand of filament you will get on the market with results that are acceptable to most users. If quality is not your highest priority, you can purchase this PLA filament for your next small project. Most users of the Inland PLA filament indicate they get acceptable results. However, there is also a significant amount of customers that reports they simply don’t get workable results. This means the PLA filament’s quality is not consistent. Although this is an acceptable cheap filament, the specifications are quite high. The filament’s diameter tolerance is +/-0.05mm and its ovality range is good. The filament is a bit brittle but not to an extent that it creates problems in the feeding tube of your 3D printer. White appears pure and all the other colors in the range are vivid. Additional color stains in the filament might make colors brighter. When you print the filament at slower speeds you will get great results. To get a stable print, use speeds of between 50% – 75% for the initial layer. The filament has some negligible amount of impurities. Therefore, it’s better to use higher temperatures when you print your model. Raising the temperature above 210°C gives excellent printing results. This brand is relatively cheap compared to the other ones mentioned in this article but its results are acceptable. This would be something you would find most useful when printing prototype and testing parts with your 3D printer. I recommend you use this filament for experimental purposes only. Buying low-priced filaments comes with some compromises. If you are just looking to make some prototype models that will be discarded later or are busy experimenting, the Inland PLA might be something you would buy. However, if you want quality and reliable prints, you will have to look at other filaments on the list. Which PLA Filaments Should You Avoid? Fry’s electronic store often sells this filament brand that you would only buy if you can’t postpone its delivery or on a desperate impulse. User reports about this filament are mixed. Even though the price tag might be tempting, don’t waste your time or money buying it. User reviews about this filament brand are very high. If you take a closer look at this review, however, you will see that most are not written well and don’t focus on the technical aspects that are associated with 3D printing. Doing a quick search on Google will help you discover that some users are just not quite satisfied with their final printing results. You can go for PLA filaments like Worksteel or AMZ3D that comes with significantly less risk and would save you the pain of completely wasting your money. 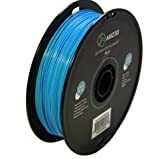 Where to Buy PLA Filaments Online? The PLA filaments mentioned in this article is available for purchase on Amazon. You can follow the links below to purchase now. Like you’ve seen in this article, there are many good filament options to choose from. If price is not a problem for you, you can go ahead and buy some of the premium filament options like MakerBot’s PLA filament. On the other hand, if you have a budget but still would like to get some quality prints something like the Hatchbox provides unbeatable quality and a dynamic range of colors.